The Lutheran Church—Missouri Synod began work in Uganda in 1994 through alliance missionaries from Ghana. Today, the LCMS supports work in Uganda through the Lutheran Church of Uganda, soon to be an Altar and Pulpit Fellowship partner of the LCMS, primarily in pastoral formation through their own seminary in the form of residential missionaries, grants, and infrastructure development. The LCMS also supports scholarships to seminaries offering higher credentials and primary school education in Uganda. The Rev. 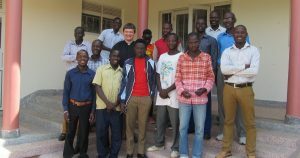 Jacob Mueller reflects on his time teaching at the seminary in Uganda.